What Does "New Book" Smell Like? Suhay will donate a portion of the proceeds from the book to SMHDC and to The Virginian-Pilot’s Joy Fund. Order your copy by June 1 and Suhay and the book’s illustrator, Sam Hundley of The Virginian-Pilot, will autograph and personalize it. Get the order form here. Learn more about the book here. 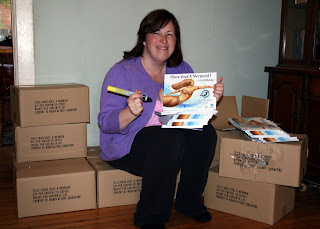 The book will be officially launched during a party at St. Mary’s Home on Sunday, July 12, from 2-5 p.m. Everyone is invited. Putting on fancy dresses or tuxedos. Dancing to the latest music and retro tunes like the requisite “YMCA.” Voting for king and queen. 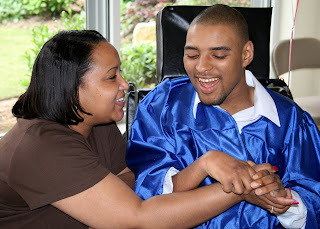 Twenty-one of the older residents of St. Mary’s Home for Disabled Children took part in these time-honored rituals of prom on Sunday. This was the fourth prom held at St. Mary’s Home and the second done in collaboration with students from Norfolk Academy, who were matched up with residents as their dates and decorated the Atrium in an Asian-influenced style, with red balloons and golden bows. SMHDC staff also helped with prom, providing food, putting on the girls’ makeup and dancing a bit themselves. St. Mary’s Auxiliary Board paid for tuxedo rentals and a DJ. 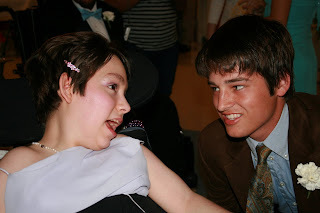 “Every opportunity they have to interact with their peers who are not disabled is wonderful,” said Marie Armstrong, whose niece, Victoria, was all smiles during the dance. As Team Hoyt VB’s members readied for a fun run at St. Mary’s Home on Saturday, they wondered if Mother Nature would smile on them. Despite earlier showers and clouds in the distance, 15 joggers/walkers and a dozen children in jogger strollers made half-mile laps around St. Mary’s property with laughs, smiles, squeals of joy and even a few claps. A few gentle raindrops felt refreshing, and the sun came out just in time for a final group picture. 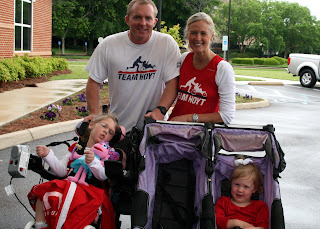 Team Hoyt VB formed in April 2008 with the same goal as the national father-and-son Team Hoyt: to integrate the physically challenged into everyday life. This local group of Team Hoyt supporters embrace that spirit wholeheartedly. They go the extra mile to make the running events happen, loading as many as 25+ jogger strollers on multiple vehicles to reach the starting line. Frank Lloyd Wright once said, “The thing always happens that you really believe in; and the belief in a thing makes it happen.” That message rings true with this enthusiastic group. Look for Team Hoyt VB at these upcoming races: CHKD 8K on June 13, Allen Stone Memorial on July 18, Surfers Healing on August 22, Rock ‘n’ Roll Half Marathon on September 6 and finishing the season with St. Mary’s 5K fundraiser on October 3 at Fort Story. William C. Giermak, CEO of St. Mary’s Home for Disabled Children, likes to joke that 2009 is the “Year of Sister Mary June.” She’s been getting some — very well-deserved — attention since celebrating the start of her 50th year with St. Mary’s Home back in February. 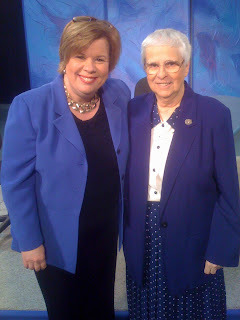 An article about Sister Mary June Morin that appeared that month in The Virginian-Pilot has led to a half-hour program about Sister that is expected to air on WHRO, Hampton Roads’ public television station, later this month. Elsie Duval, a member of a women’s group from St. Andrew’s Episcopal Church in Newport News also read that article with interest. She invited Sister to speak to the group and share lunch with them, and Sister did so on Monday. Sister told the group that she knew in the sixth grade that she had a calling to become a nun. She joined the Daughters of Wisdom right out of high school and spent seven years working at a children’s clinic in Brooklyn before being sent to Norfolk. “If help was needed, that’s where you went,” she said. Decades later, Sister is still dedicated to helping the children and young adults who call St. Mary’s “home.” You can read more about Sister in the spring issue of St. Mary’s newsletter, The Guardian, on our website. 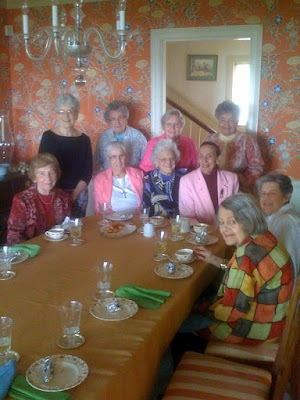 Thank you to the St. Andrew’s women’s group (shown here with Sister, who is seated second from the left) for your hospitality and your gift to St. Mary’s Home in Sister’s honor.